It is important that your accent chair matches the style of the room you’re designing while still adding a bit of pizazz. Think about the shape, fabric, and size you are looking for. Are you going for a more modern look or one that is more traditional? If you are going for a modern look, you may want to consider purchasing an armless chair is a fun and modern aesthetic. If you are looking for a more traditional style chair, you may be looking for a chair with arms that has toned down colors or fabrics, allowing it to fit right it. It’s true that an accent chair can be placed just about anywhere. Therefore, when thinking about where to place it, consider where you might use it the most. Maybe you’re looking to place it close by your fireplace for a nice and cozy reading spot. Maybe you don’t plan to use it at all and it is purely for decoration. Whatever your plan, think about where you are looking to place your chair as it could sway your decision regarding which accent chair to purchase. It’s not crazy to want more than one accent chair in a room. Many times it only feels natural to have a couple chairs between a side table or next to each other in your living room. When thinking about where you want your new accent chair, ask yourself if one is enough. Another accent chair may compliment the room nicely. One last thing to consider is whether or not your accent chair is going to be with or without arms. Armchairs provide a much more classic look to your room. They fit very nicely in living and dining rooms. Armless Chairs are not usually as large as armchairs so look nice next to a love seat or a sofa. When purchasing an armless accent chair, think about the pop of color and unique style it could bring to your room. If you have any questions about the selection of accent chairs at Aumand’s Furniture, stop by the store or contact us today! It’s that time of year again. Baseball playoffs have begun, the NFL is in full swing and hockey & basketball are starting up. There’s never a dull moment on the sports network in the Fall. You may find that your sofa means a lot more to you during this time of year. I don’t blame you. Between the hours you spend sitting watching football to the moments you find yourself jumping up and down when your favorite team won the World Series, your sofa is always there, never leaving your side. Talk about commitment. So when it comes time to move on and pick out your next sofa, it’s very important that you choose the right one. Something that will take the place of your last sofa, filling every void and maybe even going above and beyond! After all, when you have a nail-biter on your hands, don’t you want the best support? This brand offers top of the line comfortability and durability with the selection of various fabrics and leathers. Its the total package. If you’re someone who prioritizes style and practicality, La-Z-Boy is the brand for you. 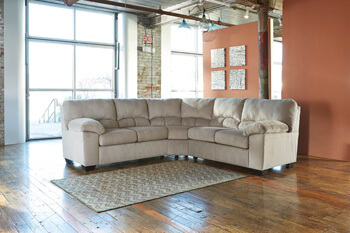 If you’re looking for a new sofa with innovative style and design, you’re going to have to check out Simmons. Whether it be reclining or stationary, Simmons offers you amazing quality at an affordable price. It’s a must-have! Talk about variety! Klaussner is guaranteed to have the sofa you are looking for. Klaussner sofas are made with great care and attention to detail. They are truly one of a kind. It’s easy to stay on these sofas for 9 innings because you will never want to leave it. Choose a sofa with a sturdy frame. Buying a sofa that has a durable and long lasting frame may be more expensive but is well worth the investment in the long run! If the sofa has metal parts, make sure they are smooth to avoid any tear in the fabric. Test the springs and confirm your sofa has them. Springs should be firm and close together. Think about what kind of fabric you are looking for. While there are several great options including leather, cotton, and linen, some are much more expensive than others and some are much more difficult to maintain. Lastly, buy the sofa that is the right choice for you. At the end of the day, the most important thing is to be excited and proud of your new sofa! We can all remember a time that we got out of bed and felt achy, sore, and even more tired than when we got into bed. Maybe it’s stress, maybe it’s that 6 mile run you went on yesterday, or maybe it’s your old mattress. It can be hard to know if it really is time for a new mattress, so we’ve laid out a few easy signs that will help you decide. 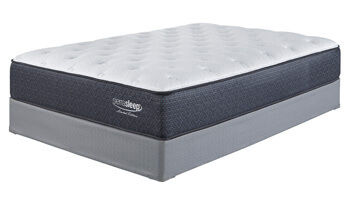 s. Some people don’t realize when a mattress is what’s causing their achy backs and stiff necks, so when your mattress is reaching the 8 year mark, it might be time to think about moving on. When your mattress gets older, it can lose the ability to fully support you. As the mattress breaks down, you can end up with painful pressure points that make finding a comfortable sleeping position nearly impossible. And while you’re trying to find that comfortable position, you’re losing precious sleep time. When you find that you get a better night’s sleep when you’re on the couch or at a hotel room, there’s a pretty good chance that your mattress needs replacing. Your midsection is the heaviest part of your body, and over time the part of your mattress that supports your midsection can sag. This can be mitigated by turning your mattress once a year, but if it always feels like you’re in a hammock, then it might be time to say goodbye to your mattress. It may be an unpleasant thought, but dust mites love to shack up in your mattress and bedding. Frequent washes and mattress covers can help to alleviate the problem, but if it persists, it’s probably time to get a new mattress. We hope you found this list helpful, but if you need a little extra guidance, come on over to Aumand’s, and check out our mattress brands. We can help you get a new mattress at a great price, plus we carry the top brands in all your other household furniture.